The 'Barkless Dog,' the Basenji, is a sighthound from West Africa and is likely one of the oldest domesticated breeds. His intelligence is equally matched by his drive and energy—and stubbornness. And though he does not bark, he does vocalize with yodels, howls, and, occasionally, screams. This breed is not an ideal choice for a first-time dog owner—the Basenji presents a challenging temperament for people who lack experience with dogs. While intelligent and able to learn commands easily, this stubborn dog prefers to make his own decisions in everything from when and where to sit to what's considered appropriate as a toy. The tenacious, counter-surfing, escape artist is also a lovable, playful companion for those who want to put the effort into training such a strong-willed breed—a sense of humor is absolutely necessary. Basenji are also known as the African Barkless Dog, African Bush Dog, and Congo Dog. Coat - The Basenji's short, fine coat may be chestnut red, black, tricolor, or brindle. His feet, chest, and tail tip should be white. As a basal breed—or a breed with DNA that predates modern breeds—the Basenji is one of the oldest types in the world. Said to have been bred from dogs who showed less tendency to bark in order to prevent a noisy dog from giving away his village's location, the Basenji is quiet, but not unable to vocalize. The type is thought to have been given as gifts to pharaohs in ancient Egypt, and tombs and art include Basenji-like dogs. Basenjis were prized for their hunting ability; bells were tied around the dog's neck or waist so hunters knew where they were while on the hunt. Basenjis weren't exported from the Congo until almost 1900. The first pair of Basenjis brought to England died of distemper prior to breeding, and it wasn't until 1937 that another attempt was made—which resulted in the death of the female Basenji and her puppies. A breeder in Boston acquired the remaining dog from Britain and began to establish the Basenji in the United States. The AKC recognized the Basenji in 1943. Intelligent, affectionate with a select few, and stubborn—the Basenji requires an owner with a will at least as strong as his own. They're ranked second to last for intelligence, but the ranking is based on the tendency to follow a command on the first request. Because Basenji were prized for independent thinking, it's no surprise they're not always willing to do as asked if it doesn't directly benefit them. Though they are friendly with family, they can be standoffish or aloof with strangers. Consistent training and doggy-proofing your home are important considerations for life with a Basenji. If you don't want it chewed, put it where the Basenji can't reach it—and that doesn't mean on the counter. This breed is known for its ability to jump high, scale fences, and get into surprising spaces. Are Basenjis Good with Kids? Though not a match for a home with small children, Basenjis may be able to live with older children if raised with them or socialized with kids from puppyhood. They aren't likely to put up with the poking, prodding, and rough treatment that can come from toddlers and babies. Are Basenjis Good with Other Pets? Cats and small animals are not ideal companions for this hunting breed, but a Basenji raised with cats may be able to live with them. They may do well with other dogs if properly socialized. Loyal, watchful Basenjis will alert you to people approaching the property, and are courageous enough to try to defend you—but they aren't guard dogs. Though they do not bark, they may offer an alert in the form of a yodel or scream. Energy is not something Basenjis lack. Without daily exercise, the high energy Basenji may become destructive. Indoor Basenjis appreciate cleanliness and are not barkers—but they can be destructive and appreciate using their voice to yodel and scream. Basenjis can adjust to most living situations, including apartments, if given plenty of outdoor exercise every day. Their voice is an important consideration if you have neighbors close by; their yodeling may not be as endearing to the neighbors as it is to you. Basenji will chew anything interesting—dangerous objects or items not meant for the dog should never be left within his reach. Outdoor While Basenji love spending time outdoors, they should never be left alone. This escape artist can easily scale a fence and is difficult to catch. While on the lam, he may chase, injure, or kill neighborhood cats, as his prey drive is strong. The Basenji dislikes rain and may refuse to go outdoors in rainy weather. While Basenjis are tolerant of hot weather, they do not do well in cold weather and may need booties and a dog jacket when the temperature drops. Exercise At least two exercise sessions of half an hour each will help keep the Basenji happy and healthy. This may come in the form of walks, jogs, and supervised romps in the yard. Basenji should not be expected to stay where you've left them as they are likely to roam. Dog sports such as lure coursing and agility may help provide high-impact exercise for body and mind. Endurance Energetic and raring to go—the Basenji has the stamina to outlast many other breeds. Running Miles: A healthy Basenji over one year of age may be able to work up to five-mile runs. Hiking Miles: Long hikes are a favorite of the Basenji, but it's important to ensure a solid recall—no mishaps—if you choose to let your Basenji off-leash. New sights and smells and critters may be too tempting for the Basenji's high prey drive. Consider the dog's temperament in his interactions with strangers prior to taking on a long or busy trail. Food The general recommendation for how much high-quality dry dog food to feed a Basenji is ¾ to 1 cup per day given in two meals, based on average activity level and weight. The Basenji is prone to weight gain, which can be prevented with an appropriate diet and exercise. Food guarding behaviors may be present in Basenji, so early training to mitigate this behavior is important. This guarding behavior may extend to items stolen from countertops and trash cans. If resource guarding behaviors arise, an animal behaviorist can help stop it. Children should never be allowed to touch or remove food while any dog is eating. Alone Time Basenjis are family-oriented dogs who prefer the company of their people, but you can perhaps leave your Basenji alone for up to eight hours. Basenjis may be destructive when left alone, so crate training may be necessary. Trash cans and dangerous items should not be left within a Basenji's reach as they will likely be chewed. While a dog walker may be a good strategy to help burn a Basenji's excess energy during the day, the breed may be standoffish or distrustful of new people, and proper introductions should be made in advance. Basenjis are meticulous groomers; the fastidious breed requires only occasional brushing weekly and baths only as necessary. Trimming nails regularly will help prevent painful splitting, cracking, or a broken nail. Early exposure to handling is important for the foot-sensitive Basenji. You can minimize serious health concerns in a Basenji by purchasing her from a reputable breeder who engages in responsible breeding practices, and through screening for common diseases and conditions. Basenjis are an intelligent breed, but their stubbornness and independent nature often have trainers convinced otherwise. They finished next to last on an intelligence ranking based on the ability to follow a command on the first request—but Basenji fanciers don't tend to agree with the results. The breed was expected to think for itself, and that it does. Without consistent training, a Basenji will take over, but with positive reinforcement and continued training from an owner who doesn't back down, the Basenji can be a delightful and well-behaved companion. Just don't be surprised if the Basenji outsmarts you. Basenjis are masters at lure coursing and have the drive and speed to compete in sighthound racing. Their sense of smell makes them a good choice for nosework, and with patience and consistent training they may do well at advanced obedience or tricks training. They're high-jumping canines who do well on the agility course, as well. Advanced training will help burn off the Basenji's excess energy and keep their quick minds busy. Though less common as a modern hunting dog, the Basenji's original use was for flushing game into nets for hunters. Sporting dog training isn't out of the question for this athletic breed, but the Basenji may be more difficult to train than other hunting breeds. 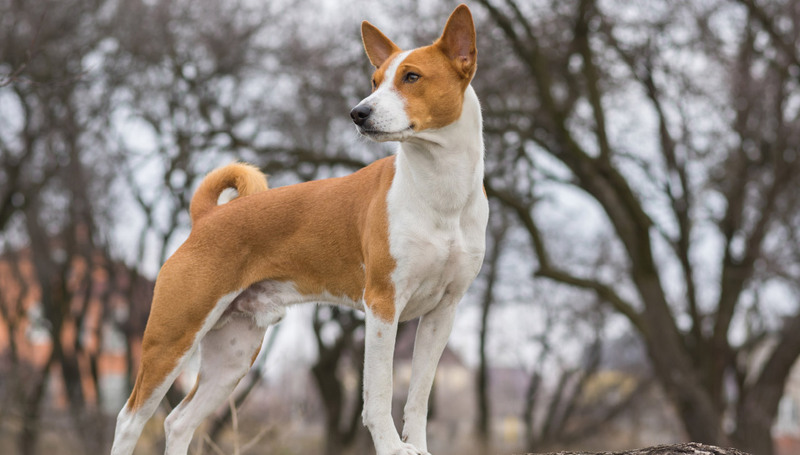 They're known to roam and have a mind of their own, but with patience, you may transform your Basenji into a good companion for small game hunting. While tainted foods and other factors can cause this condition in any breed, Fanconi syndrome may be inherited by Basenji due to a genetic mutation. Fanconi syndrome reduces kidney function—the kidneys no longer process proteins properly, and instead necessary proteins are expelled in urine. Fanconi syndrome symptoms—including excessive drinking and urination and glucose detected in the urine—usually show in Basenji between four and eight years old. Symptoms of Fanconi syndrome may be mistaken for diabetes. It is the glucose in urine with a lack of elevated blood glucose levels that aids in the distinction between Fanconi Syndrome and diabetes. A DNA test is now available to determine whether Basenjis have genetic markers that may predispose them to Fanconi syndrome. The test results show: probably clear, probably carrier, probably equivocal, and probably affected—allowing veterinarians to determine the likelihood of the dog presenting Fanconi syndrome in the future, and for breeders to determine which dogs should not be bred. If owners choose to forego the DNA test, they are advised to use a urine test strip monthly to observe for elevated urine glucose levels. If treated—the protocol includes providing many supplements and electrolyte replacements on a daily basis—dogs with Fanconi syndrome may be able to live a comfortable life. Untreated, the condition is fatal. Breeders should not continue to breed dogs who have produced litters with Fanconi syndrome dogs. The Basenji's larynx has a unique placement and shape, which prevents a typical bark. This trait was likely bred for by selecting dogs who didn't bark to develop a 'barkless' breed. A quieter dog wouldn't give away the village's location, and therefore it was more desirable. Though Basenjis don't bark, they do yodel and growl—and they can scream. Because they were so quiet, hunters would outfit Basenji with bells so they could locate their prized dogs while hunting.